▶ SoldThis listing was sold on Nov 16, 2017 for the price shown here. 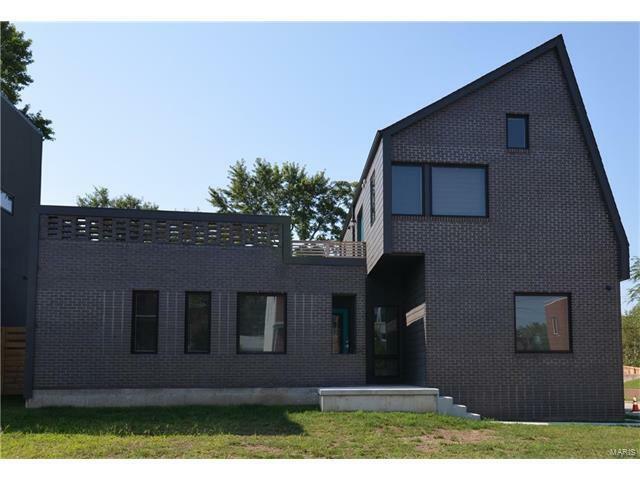 Step out of St. Louis traditional and into this stunning custom modern newly built home. Beautiful handscraped wood flooring throughout the main level. The main floor master features a walk in closet w/ custom shelving, bathroom with heated floors, two sink vanity & a gorgeous walk in showerand tub. Open hearth room & kitchen feature a gas fireplace, large island w/ a waterfall quartz countertop, stainless steel appliances & pendant lighting. The main floor laundry has cabinets & plumbing for a sink. A half bathroom & hallway leads from kitchen to the screened in porch and to the oversized 2 car garage. Upstairs are 2 more bedrooms w/ vaulted ceilings & fans. Two amazing rooftop decks & one leads down to the patio & fenced in backyard. The 9ft pour basement has a rough-in bath, egress window & sump pump/pit. Security system w/ 10 cameras and 24 hour monitoring. Surround sound, intercom, Nest thermostat, wifi enabled locks, custom window treatments, exterior motion lights and much more! From highway 64 take Tower Grove exit and turn left on Blaine Ave. From highway 44 take Vandeventor and go straight to Tower Grove and turn left and right on Blaine Ave.